I've had this book on my TBR pile for quite a while. 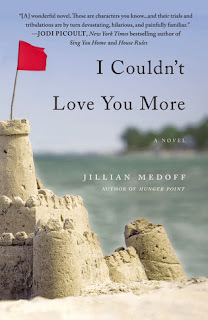 I decided I Couldn't Love You More by Jillian Medoff would be may pool book (after I finished the first book I chose in just a couple of days). I have mixed feeling about it. I loved Jillian's writing style. It was easy to fall into the story (even if a week past before I picked it up again). The story flows so well that I would fly through the pages. The story itself might not be something that I'm totally crazy about. It was interesting to have a story set so near home. While there is the tense situation created by the near drowning incident, the story was overall kind of boring. If I thought the plot was boring, why did I keep reading it? Characters really make the story for me. If I connect with a character I'll keep reading just to see what happens to him/her. I really liked Eliot. Her struggle to find her place in both her childhood family and her adult family, confusion over a past lover, discovering who she is all endeared her to me. I wanted everything to turn out for her. For how much I loved Eliot, I absolutely HATED her sister Sylvia. Her character was just too over the top for the tone of the story. She had too many character flaws. I was shocked to find out that she is a lawyer and apparently successful. I might have been able to handle her meddling (though I didn't understand her obsession with tracking down Eliot's ex-boyfriend) if that was all. But then there was her self-centerness - wanting everything to be about her, even a child's birthday party. And related to the selfishness, her hypochondria-ism about drove me batty. The crying wolf thing got old really fast. I think if Sylvia had been toned down or absent all together, I would have found the story more enjoyable. She wasn't even a character you love to hate. If you enjoy stories of everyday life filled with family drama, then I Couldn't Love You More would be your kind of book. The writing was great and I wouldn't hesitate to pick up another boo by Jillian Medoff. For a glimpse behind the scenes of I Couldn't Love You More, check out the post Jillian wrote last year for Girl Who Reads. Girl Who Reads is an Amazon advertising affiliate; a small fee is earned when purchases are made at Amazon through the link above. A free book was provided by the indicated source.